On the occasion of our visit of the American Star in February 2007, we already announced it: We too wanted to honor this famous ship by producing a video that was also partly done during our helicopter flight above the wreck. However, this film should be more: A tribute of the many stages that the former AMERICA, WEST POINT, AUSTRALIS or AMERICAN STAR experienced during her diverse history and a last view at the remainders. And nobody could have ever predicted how timely we reached the last destiny: Only after a few days of our then visit and our memorable helicopter flight, she finally collapsed - the Old Lady. With this, we created a unique tribute since obviously nobody else had another opportunity to make such a film. Contrary to NDR’s documentary from the year 1999 running about 45 minutes, we only produced a 30 minutes feature film; however, we think that this is long enough for the last cinematic tribute of the American Star. Since we produced this film for the German and English speaking fans of the ship, it is available in both languages on one single DVD. 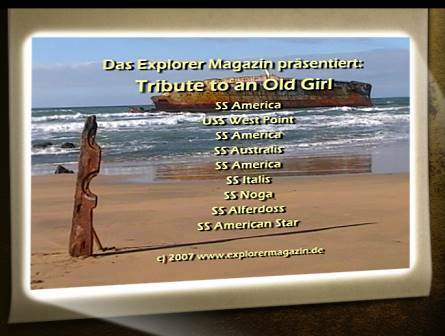 The remembrance film now presented to our readers belongs next to the special edition CD "American Star" on the bookshelf and with that to the detailed documentation about the "Old Girl" which we collected throughout the years. Therefore, we offer our "Memento Package" in two versions: As a video DVD including our CD or the video on the DVD alone. This way, we believe that we will fulfill the wishes of the American Star´s fans and that for a reasonable price that is substantially under the one of the NDR documentary. You can order by using the order form - we will then get in touch with you! And here you find a little YouTube-teaser regarding our documentary video "Tribute to an Old Girl" which came on DVD in November 2007 ..! Link to overview "American Star"
Link to special edition CD "American Star"